Three principal changes were approved by the Board of Education at the June 5th meeting, according to Superintendent Cory Uselton. 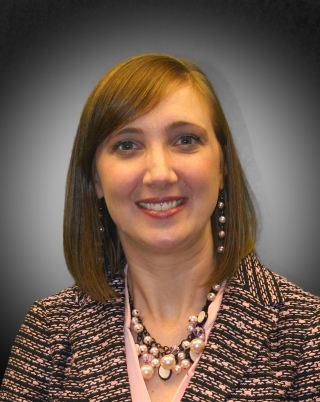 Allyson Killough will be the new principal at Career & Technical Center—West. She has served as principal at Olive Branch High School for the past four years. 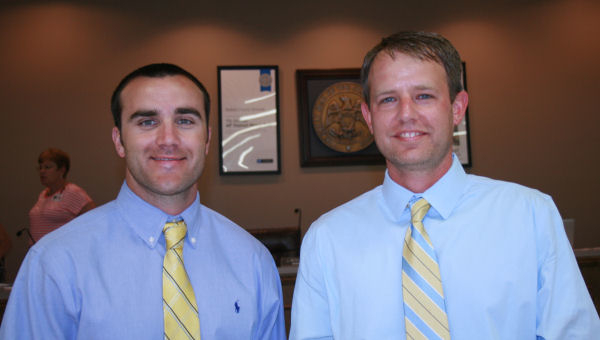 Jacob Stripling will be the new principal at Olive Branch High School. Stripling has served as principal of Center Hill Middle School. He also worked as assistant principal at Hernando High School and Horn Lake Middle School. Larry Hood will be the new principal at Center Hill Middle School. Hood has served as assistant principal at Olive Branch Middle School, Hernando Middle School, and DeSoto Central High School. For the past three years, Stripling has led Center Hill Middle School to become one of the top middle schools in Mississippi. 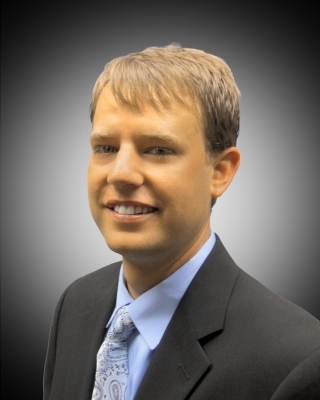 He has also served as an assistant principal at Horn Lake Middle School and Hernando High School. “Jacob Stripling will bring strong leadership skills to his new role as principal of Olive Branch High School. He is excited about being a part of the pride and tradition of Olive Branch High School and he looks forward to working with the Olive Branch students, teachers, community and alumni base,” Superintendent Uselton said. The new principal at Center Hill Middle School is Larry Hood. 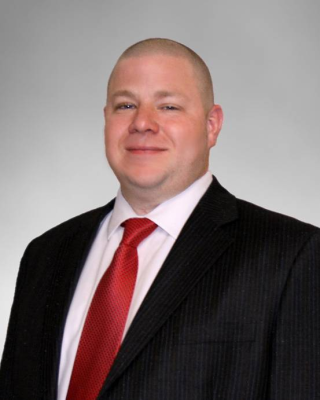 “Larry Hood has been a very successful assistant principal at both the middle school and high school level, and we are confident that he will be an excellent leader for Center Hill Middle School,” Uselton added. MASSP Principal of the Year Chris Fleming celebrates with his wife Shannon. The Mississippi Association of Secondary School Principals (MASSP) has selected Chris Fleming, principal of Lewisburg High School in the DeSoto County School District, as the 2017 Mississippi High School Principal of the Year. 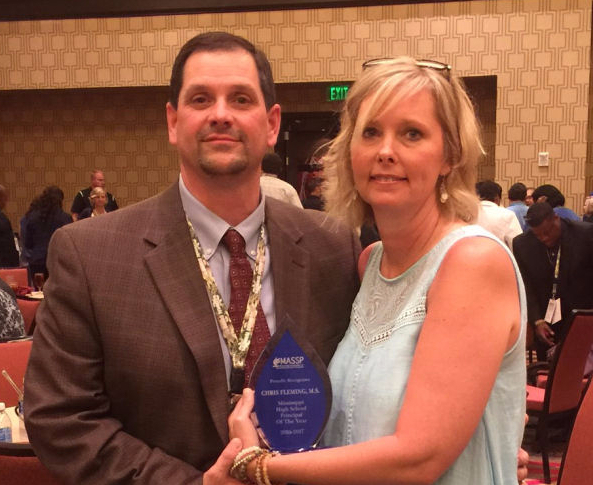 Fleming was presented the award during the summer MASSP Summer Conference in Biloxi on June 15th. This was the second time Fleming was recognized by this organization with the top honor. In 2013, he was named the MASSP Middle School Principal of the Year. At that time, he was Principal of Lewisburg Middle School. Top principals are awarded the recognition based on their impact in the areas of collaborative leadership, curriculum, instruction and assessment, and personalization of the learning environment. In 2017, Lewisburg was named the #1 High School in Mississippi by U.S. News & World Report for their academic achievement. According to the National Association of Secondary School Principals website, 50 states, the District of Columbia, the U.S. Department State Office of Overseas Schools, and the Department of Defense Education Activity select one middle level or high school principal to represent their state. From these state winners, three finalists are named as contenders for the National Principal of the Year award. The NASSP National Principal of the Year is then selected from the three finalists. NASSP honors all State Principals of the Year at the Principal’s Institute held each year in Washington, D.C. The Institute not only salutes the principals but also provides a forum for honorees to advocate for education and share best practices and expertise. Tyler Turner has been hired as the new Olive Branch High School Conquistador football coach. Turner served as the head coach at Liberty Tech Magnet School in Jackson, Tennessee before accepting the position at OBHS. He is credited for developing a state challenger with the team in two years. He also served as an assistant coach at Wynne, Arkansas, and helped turn around their program. A total of 197 music teachers from 187 cities across the U.S. are quarterfinalists for the Music Educator Award presented by the Recording Academy and the Grammy Museum. Two of these music teachers work for DeSoto County Schools. Jennifer Bourbonais, Overpark Elementary School, and Jamie Young, Lake Cormorant High School, made the select list. The award is open to current U.S. music teachers, and anyone can nominate a teacher. “I am honored to represent Overpark, DeSoto County Schools, and the education of our state. Music in our schools really does have its place for every child and can provide opportunities for them to learn a love of music that will carry with them for the rest of their lives,” Bourbonais said. “I have no idea if I'll go on to be a semifinalist or not. Either way, I'm okay with it. I am truly part of the best district in our state and I believe one of the best districts in the nation. Any positive light I can bring to our school system locally or nationally is all to God's glory. I am just so grateful to be part of such a great district with leaders that truly care about our students and faculty and who promote music in our schools,“ Bourbonais added. 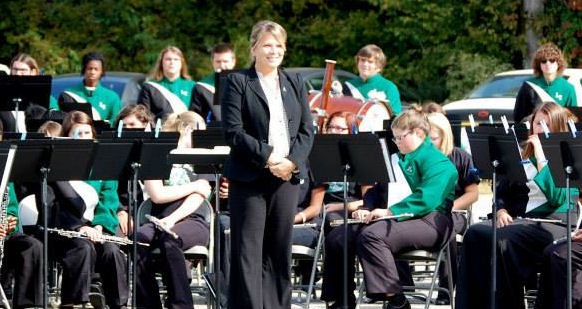 Jamie Young said she also was honored and humbled to be a quarterfinalist for the Grammy Music Educator Award and to have this opportunity to shine a positive light on Lake Cormorant, DeSoto County Schools and music education. 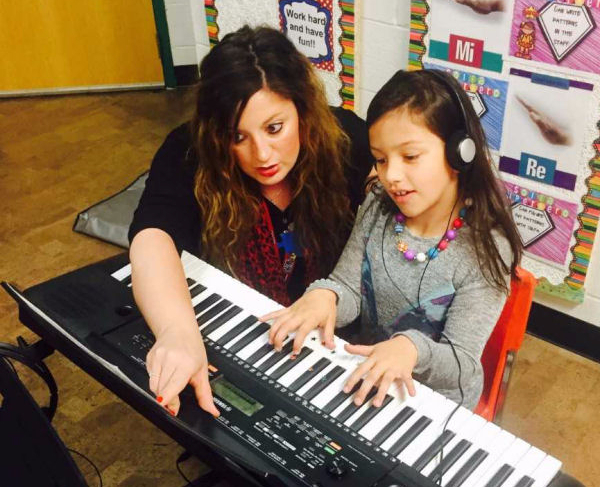 “My philosophy for music education is to provide each student with a quality music education that will help develop the “whole” student,” Young said. “An education that not only addresses many different learning styles but offers enrichment, team building and multicultural practices that the student can use throughout their life, to give my students the tools they need to be successful and lifelong learners of music. 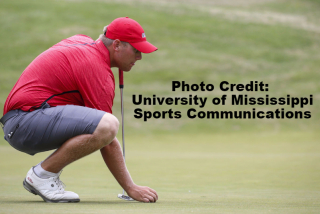 Braden Thornberry finished in the top 5 of the FedEx St. Jude Classic Golf Tournament. This is the first amateur to get this rating since 1965. Braden, an Olive Branch resident, is a graduate of DeSoto Central High School. He is a college sophomore at Ole Miss, and is 20 years-old. The 2017 NCAA champion had a final round 65 in the FedEx St. Jude Classic. Thornberry finished -8 overall, tied for 4th in his PGA Tour debut. Here's what the Olive Branch native said after a Sunday to remember. "It was awesome. Had a pretty good gallery all week but obviously when you're up near the lead and a hometown guy there's gonna be some extra people out there so it was awesome having their support and I think the NCAAs was the perfect practice round for this week. You know having the ropes, the cameras, the people and stuff like that cheering you on so it was kind of a bigger version of that but you know it's still the same golf course and same golf." 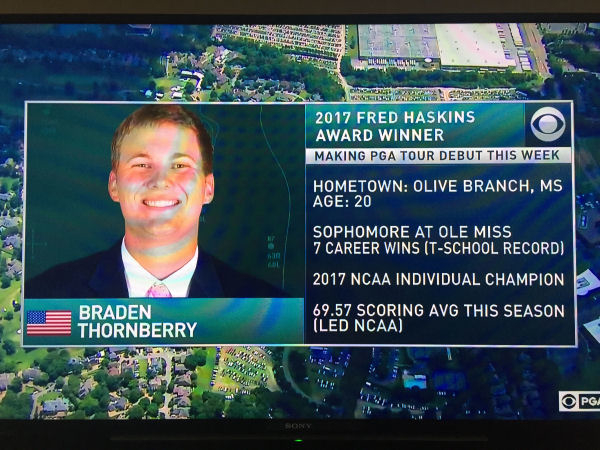 Thornberry also has the Haskins Award, the Heisman Trophy of golf. It is awarded to the top collegiate golfer in the United States. Others who have received the award include Tiger Woods and Phil Mickelson. Click the link below to read the complete article written by Geoff Calkins as it appeared in The Commercial Appeal on June 10. The arts are alive and well in DeSoto County Schools. 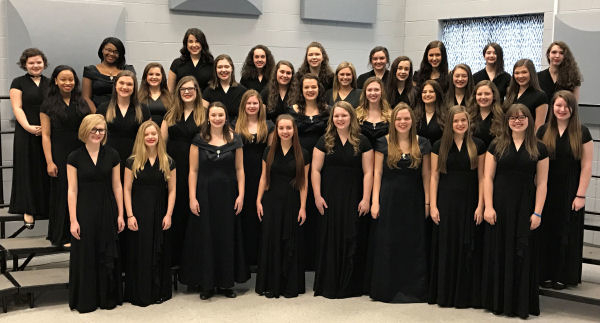 Lewisburg High School’s Capriccio Women’s Choir has been selected to sing at the 2018 Mississippi Music Educators and American Choral Directors Association State convention in Hattiesburg, MS on March 23, 2018. “This is an honor usually awarded to one or two high schools every year, and we are beyond thrilled to be the ones selected this year,” said Jessica Contreras, the choral director at LHS since the school’s inception. “We now join a long line of DeSoto County Schools’ choirs who have been selected over the years including Horn Lake, Olive Branch, Southaven, DeSoto Central, Hernando, and Center Hill High Schools as well as Hernando Middle School,” she added. 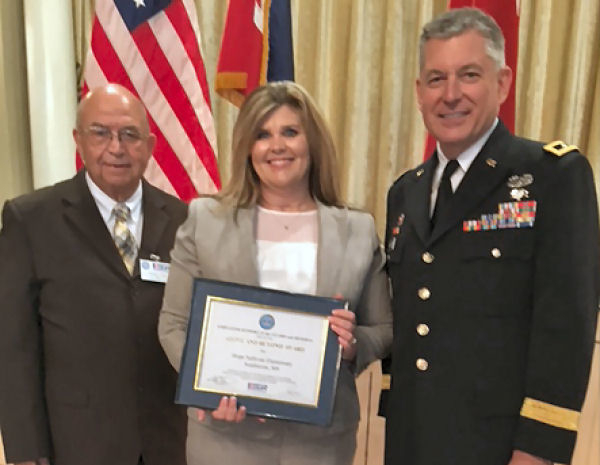 Hope Sullivan Assistant Principal Laura Hadaway accepts the award from Aubrey Ray, Mississippi ESGR Chairman, and Adjutant General J. Boyles. Hope Sullivan Elementary School won a Department of Defense award for going "Above and Beyond" to support the Guard and Reserve. SES Assistant Principal Laura Hadaway accepted the award at the Employer Support Award’s Luncheon in Jackson, MS.
legal requirements of the Uniformed Services Employment and Reemployment Rights Act by providing their Guard and Reserve employees additional, non-mandated benefits such as differential or full pay to offset lost wages, extended health benefits, and other similar benefits. The award is given in limited numbers by State Committees to employers who have had at least one of their supervisors/managers recognized with a Patriot Award, and who have signed or agree to sign an ESGR Statement of Support. The Award is a Department of Defense award given to the employers on behalf of the Men and Woman of the National Guard and Reserves. 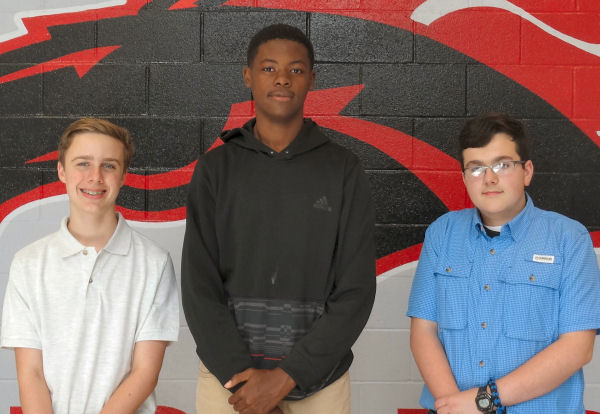 142 eighth grade students at Center Hill Middle School proved they are tech-savvy by earning a technology certification through Microsoft. Sheila Bruno and Shirley Harrison are the Technology Foundation teachers who taught these students and will be offering this certification to students next year. Microsoft Office Specialist (MOS) certification is the premier credential chosen by individuals seeking to validate their skills and advance their careers according to all online sources. Pursuant to Microsoft, MOS certification provides globally recognized industry endorsed evidence of individuals who are seeking to validate their knowledge, skills and abilities with Microsoft Office Word. The top scorers who earned the highest score in the shortest amount of time in Mississippi are Carson Ewing, Michael Johnson and Zach Medlin. 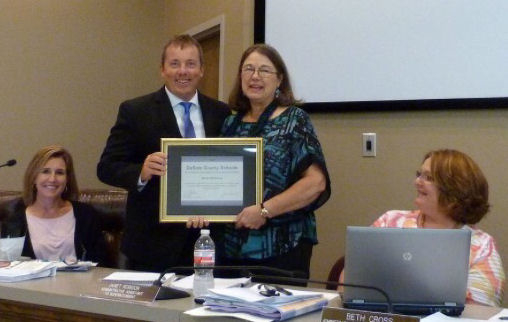 School Board Member Michele Henley and Board Clerk Beth Cross look on as Superintendent Cory Uselton presents longtime administrative assistant with a plaque to recognize her years of service. Robison's retirement is effective June 30. Photo courtesy of Rob Long.